We bloody love old stuff don't we? So much so now that companies have clicked onto our weakness of wanting to play with things we once loved, so we are now seeing mini consoles selling for stupid money on Internet selling websites, and also modern day prices for games we once adored. Burnout is a game that has surely been played by every gamer out there, with the game for me being one of the first games I played on Xbox Live, an experience that has stuck with me to this very day. Burnout no matter the number or cool second name it was given was just a blast to play, with speed and action taking center stage at all times. 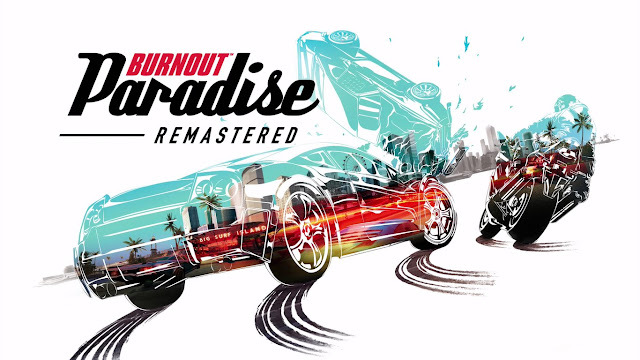 I will be honest here, Paradise was perhaps my least favorite Burnout game that has come out, I can't put my finger on why, but it just didn't grab me like other games I've played in the series. When the remaster was announced the Internet went crazy about it, with many of us more than happy to throw money at EA once again (Forget most people said they were never giving EA a penny again, this is Burnout after all. Shhhhushhh). Being an Xbox One owner the news of this remaster wasn't as big of a deal for me, as only recently we had the BC version available to us, with the chance of playing the original game all over again at a fraction of the price. Now yes, the remaster does look a bit better and may even run a little better. It also comes with all the DLC for the game including vehicles and Big Surf Island location too, but does that really warrant a £30.00+ selling price for a game that is over ten years old? That's why I decided I need to give this a look. The premise of a Burnout game is so simple a child could get it. Paradise city is a decently sized open world map which has loads of events and tasks for you to do in both this map and also the Big Island Surf map which is accessed via a bridge in the game. Winning adds a win to your current license, with the end goal being to get yourself that elite license. The events on offer are. Race: Here you must go against seven other AI racers in a race to get from one point to another. There are no set routes here, so simply get to the finish line as fast as you can before anyone else. Road Rage: This is what I deem classic Burnout, with this mode seeing you need to get a set amount of takedowns (the games cool way of saying making another car crash) to complete the event. Stunt Run: Score the required total to beat this event. Jumps, boosting, drift, barrel rolls, do whatever you can to reach the score to beat the event. Marked Man: In this event, you have cars trying to take you down as you try to get from one point on the map to another point. If these cars do their job and take you down enough times you will find your car in a critical state, one more hit after that and it is game over for you. You can combat this slightly by taking your time and driving slower in these events, but you can also find a handy auto repair shop to drive through if you happen to see one or know where one is going to be as you make your way to your destination. Burning Route: This mode requires you to use a certain vehicle if you wish to try and beat it. This can make these a little annoying if the junkyard is miles away and you just come across and want to try it. On top of these events, you have loads of things to do on the streets of Paradise city and Big Surf Island that you could lose hours in if you find yourself addicted to collectibles. Smash billboards, find super jumps, smash gates, find the parking garages, as well as finding all the repair stops/gas stations/paint shops, and junkyards found all over the map. Most streets also have a thing called road rules too, with these having a time or crash amount to beat on them while you just drive around exploring. While a timed one is simply getting from one end of the road to the other within the time shown, the crash event is certainly a bit of a pain to get started, and actually just isn't explained all that well or I missed it. Find a crash event by pushing up on the d-pad on any street that has one, then on that street get a bit of speed and hit all four shoulder buttons to get going, with the mode only stopping when you have drained the boost meter out on the bottom of your screen, which you keep filled by hitting as much stuff as possible. The final thing to talk about is the online play, something that if being honest hasn't really aged well at all. Here you can jump in with other online players and compete in challenges and events, which fully depends on how lucky you are getting into a game. While it seemed easy to get into a game where driving around doing challenges and things were on offer, I've found it impossible to find one offering a simple race, and also no one joining if I tried making one myself. While driving around doing challenges is somewhat fun for a while, it can also get a little boring after 30 minutes of playing it. Overall: If you enjoyed Burnout Paradise and don't own the 360 BC version on your One, then I can't really say you're not going to enjoy this game at all. While it does feel a little dated in some places, Burnout Paradise is easily still one of the most fun arcade races out there. That said, it's not perfect. Just simple things like better map markers which give the best route other than the simple red marker and flashing road signs at the top of your screen could have made it better. Trying to hunt down things for achievements and sort of have to plan out your route before setting off with one wrong turn resulting in having to go back on yourself does get annoying. The online play certainly feels dated, with a better menu system and ability to join certain games needed badly, with me having the game a few weeks now I've still been unable to just play a simple race online for the achievement. Fun but a little dated I guess is the summary. Not a big racing game player but this sounds fun. When I do play them, I prefer the more Arcade style feel of these types of games over the more realistic simulation style. From the sounds of it they really should have polished up the online options though especially with that price tag being a little bit high. A remaster should try to improve on the original in ways other than bringing the graphics up-to-date, they should also include quality of life changes where possible. In 2018 gamers need better options to find games, especially on a title where the online community may not yet be established or is too niche to ever have a huge online online presence.